The infographic almost invites us to look again at what might be the actual cartography of fear and areas of concern about the meat that arrives on our tables–and how to control the presence of strains of Salmonella that might lie in it–by reminding us of the dangerous hues of underdone meat. The broad distribution of cases–even if few in number, and with one fatality tabulated so far–birds in crowded sheds, clambering over feces, in whose fetid air incubate multiple bacteria, in a scene of crowding difficult to convert to gathering for a collective bonhomie celebrated around the Thanksgiving table. The leap from bird to dining table has many operations that we tend to black box, but the site of antibiotic-resistant viruses are hard not to seek in the treatment and floor of the birds that we raise for food–and the conditions to which their concentration leaves us vulnerable to foodborne bacteria, especially among the elderly and children as well as all whose immune systems are compromised. The vulnerability of groups to how meat arrives on the plate, or how bacteria travel to the gut, is a complicated itinerary; if over one in ten people are exposed to foodborne diseases, compromising, the World Health Organization approximates, 33 million years of healthy life, Salmonella not only contributes to one fourth of all diarrhoeal diseases, but finds 550 million people falling ill each year from infections– including 220 million children under the age of 5 years. With over 2500 Salmonella stereotypes identified, all of which can cause disturbances in the human gut, the infection seemed a decisively first-world problem. The strains can almost all live in multiple hosts–including turkeys and other raised poultry, as well as in pets, and can pass across the food chain from feed to animals hosts to food-preparation, food-services, or kitchens, with many infected animals not showing external signs of the disease–making it difficult or near impossible to map with specificity as a foodborne disease, triggering abdominal pain and nausea. The alarming graphic of Salmonella outbreaks in the nation that is in the header to this post added a new twist to an appetite for data visualizations that caution us to better inspect what we eat–and how we cook what we eat–a few weeks in from Turkey Day, that potlatch of fragrantly flavored foul. Much as the actual meal often interrupted by apprehensive inspections for pink-red hues as the bird is carved or consumed–inspections that almost form such a part of the annual repast that provokes calls to the dedicated phone line at the US Department of Agriculture–the graphic of reported cases of food-poisoning are rendered to trigger the image of underdone meat. The cases documented so far includes turkey pet foods, to be sure, but the alarm has resonated nationwide, as the bird of sacrifice, tied to a shipment of turkeys from a Wisconsin farm on September 11 cast suspicion on a range of turkey product– lean turkey, taco-seasoned turkey, and Italian seasoned ground turkey–but elicited deep fears about preparing those birds we tend to eat this time of year. 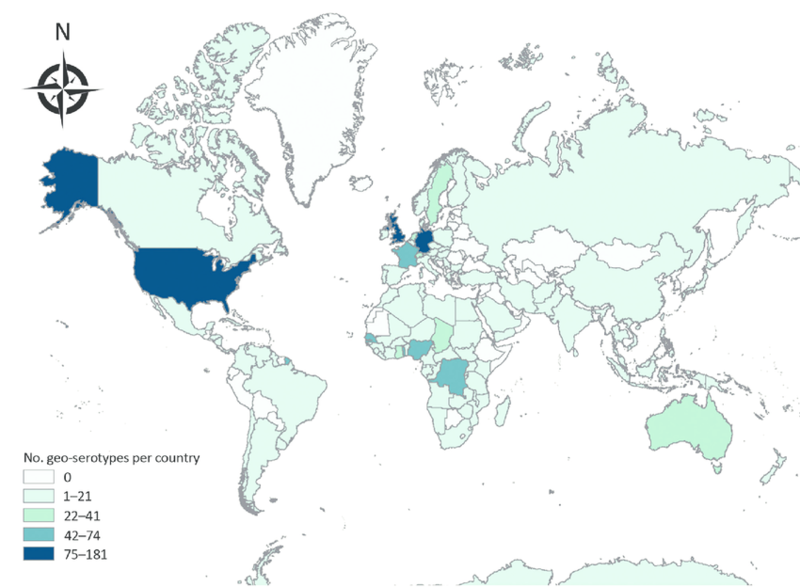 Although Salmonella is a global affliction, it makes sense to take stock of its prevalence of a range of serotypes both in nations with more fully industrialized the food supply chains and farming, as well as those afflicted by deep challenges of public health. 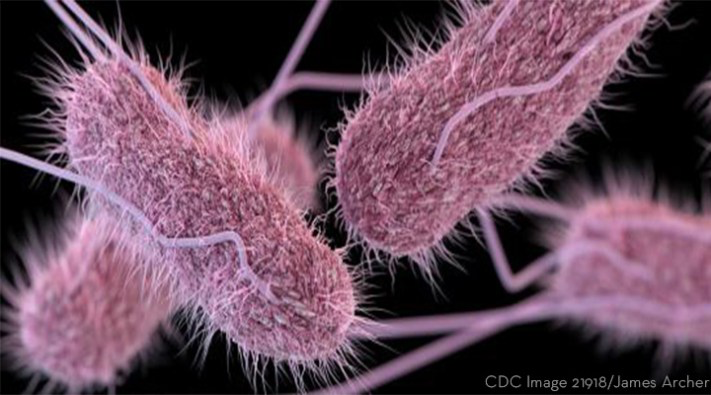 The growth of new Salmonella strains within the United States is a worthy subject of concern. In ways that may tamper the popularity of would be health alternative of turkey burgers, the underside of the expansion of a turkey industry may well be exposure to the very viruses that antibiotics–if often used responsibly at some of the smaller farms–may have been introduced in the more overcrowded practices of breeding, housing, and of the inescapability of antibiotics from the daily regimens of bred birds as a possible vector of bacterial poisoning we are increasingly pressed to map–despite the network of factory farms that it may reveal, and the poor detail of tracing such foodborne infections in distribution networks to farms. Even if many of the outbreaks may have been related to unsafe handling of pet food, failing to wash hands, or handling ground turkey, or working with turkey products, the fears of handling those big, raw turkeys–the cleaning out of the caverns or dealing with the juices of defrosted birds–provokes national anxieties that balance the burden carried by the national meal as an instance of culinary gemütlichkeit, undermining the notion of family unity by leaving the elderly most vulnerable: the recent growth of outbreaks of bacterial poisonings in recent years have led to a rise in Salmonella litigation as firms offer online forms to file food poisoning suits about specific Salmonella strains. Although the range of Salmonella infections that occur in the United States–about a million are approximated to contract the infectious bacteria every year–the spotlight of individual events among the 20,000 hospitalized who are able to conclusively map the origins of the disease onto a culpable party have led to a broad interest in mapping infections and attributing blame. The growth of this micro-food crisis in part reflected the award of a $6.5 million lawsuit against Foster Farms, on behalf of a five-year old child who suffered brain damage after being poisoned by the foodborne Salmonella Heidelberg strain, and a $4.5 million dollars awarded to a man who came close to death after salmonella Heidelberg led to a meningitis infection, opening broad fears to the transmission of pathogens in poultry, from chicken salad to turkey pet food to ground meats: a lawsuit filed after a chicken salad was feared to compromise the functioning of the transplanted liver sold under the Fareway label in Iowa lead a provider of specialty meats to recall over 20,000 pounds of the salad suspected of contamination with Salmonella Typhimurium. The concerns of food poisoning by a strain of the bacteria has encouraged a dedicated Salmonella Blog, collating further information about the hundred and thirty-five currently known to suffer from infections contracted over the past year from Salmonella Reading, an outbreak strain transmitted from a gamut of turkey products purchased raw–including ground turkey, turkey pieces, or whole turkey–in different brands but tagged only to turkey products from Minnesota so far, site of the largest number of pounds of farmed bred turkey in the nation, dense pockets of turkey breeding, and a decisive density of state-run and small poultry slaughtering establishments, as shown in the first image below. Such fears inescapably intersect with the fear of their origins in factory farms, and the antibiotic-resistance that might be bread in these large caverns, usually hidden from view, that we hesitate to imagine would ever have to do with the neatly packaged shrink-wrapped containers of turkey meat. (Indeed, the very specter seems to warrant encouragement for the notion of laboratory woven strands of turkey meat.) There doesn’t seem an ability to map the outbreak strain tainted ground turkey at any distributor, leading to fears “it might be widespread in the turkey industry,” but although its presence was so far detected in ground turkey, turkey patties, and pet food, the presence of the stain in live turkeys as well suggest the resistant strain should haunt the holiday table, not to mention the counters where the frozen bird thaws. The turkey-flesh-tone coloration that the nation adopts in the graphic suggests the steep risks that the outbreaks pose to the national tradition, cast as a deep disturbance to national identity, with the fear of ill-health being the result of the bounty being annually offered to the domestic table in “our” annual prepared holiday meal–here served, in Rockwell’s classic 1919 image, as an image of post-war plenty. Yet does an image of Thanksgiving tied to the abundance of harvest crops find itself replaced by being haunted, in the Trump era, by a perpetual sense of fear of poisoning, prehaps rooted in the salient expansion of agrabiz? 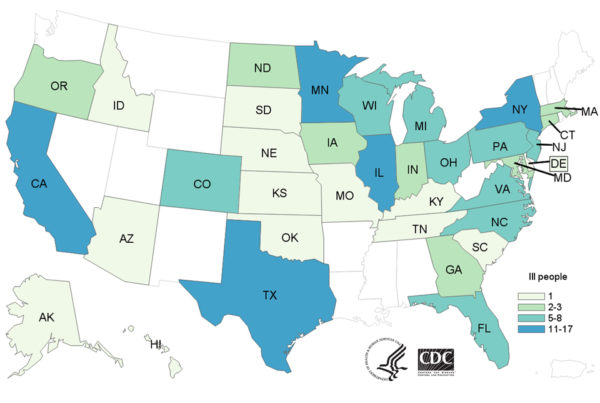 While the public health advisories have been coming, the lack of transparency of infectious vectors has gained considerable attention this year, and not only on social media, but in the public eye. 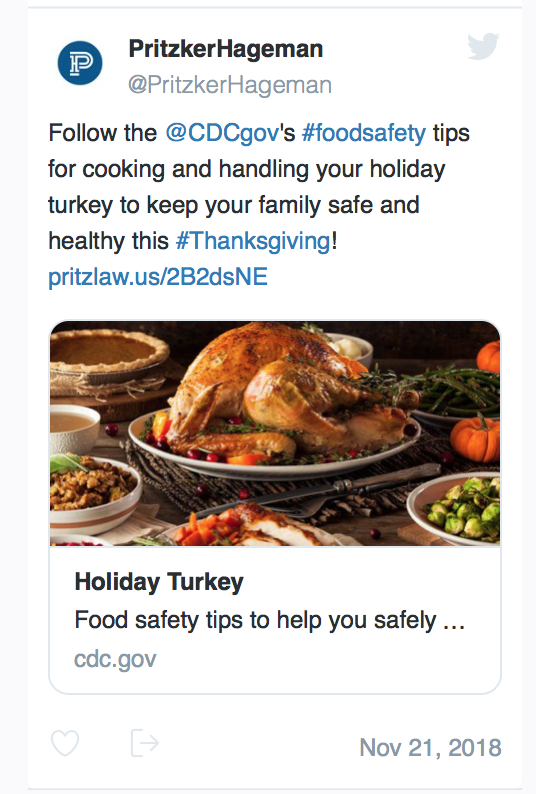 This year, unlike other years, law firms as the prestigious Pritzker Hagerman firm used advisories to elicit fears of food poisoning about the sacrificial bird–combining injections for food safety and holiday greetings with sense of trawling for possible cases of food poisoning in the Twittersphere, as if insulating the healthy holiday table from the factory farm. It may well be that public health advisories, monitory maps, national fears, and questions of liability are mixed within the social media blender. Deep fears of undercooking turkey meat, baked deeply into the American culinary psyche and rhythms of holiday sociability, is provoked by the Thanksgiving Day table, when relatives pick over the hues of bird they are served warily, hoping not to detect undercooked meat of a somewhat rosy blush: fears of undercooked turkey are so salient that the USDA Meat and Poultry division maintains a dedicated line on which it reports getting frequent calls on its dedicated hotline about the color of “under-done,” seeking to resolves their guests’ alarm at being served pink meat on Thanksgiving tables, even being called into resolve full-blown family arguments–as if providing something more like family therapy or problem-resolution as much as advice–or even intervention. 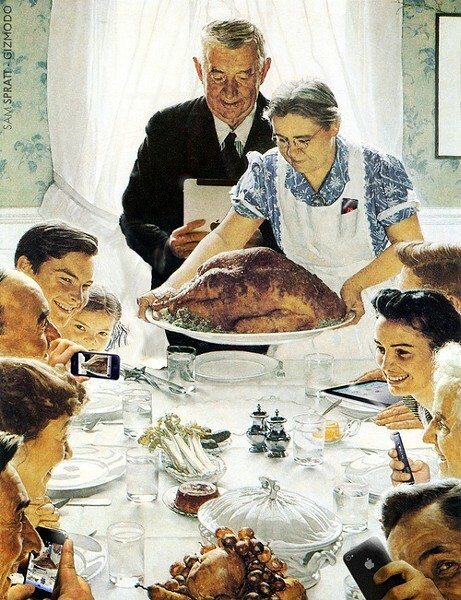 So closely is the preparation of the meal linked to a culture of culinary affirmation that it seems right for Sam Spratt to integrate the image of multiple selfies into Norman Rockwell’s classic scene of offering up the cooked bird, as its preparation has become a form of self-perception, if only in hosting the ideal feast, displacing the cooked bird from the reassuring center of holiday sociability. Often, confusions in coloration arise at the dissonance of how turkey meat looks in contrast to, say, beef, and the warning signs that such rosacea hues provoke, and the tendency to link lower temperatures–or recesses deep within the bird–to a pinkish coloration of underdone meat–encouraging embarrassment at the Thanksgiving table, as the sort of coloration associated with under-done beef regularly crops up in some parts even of prepared turkey prepared above the threshold internal temperature of 165º. 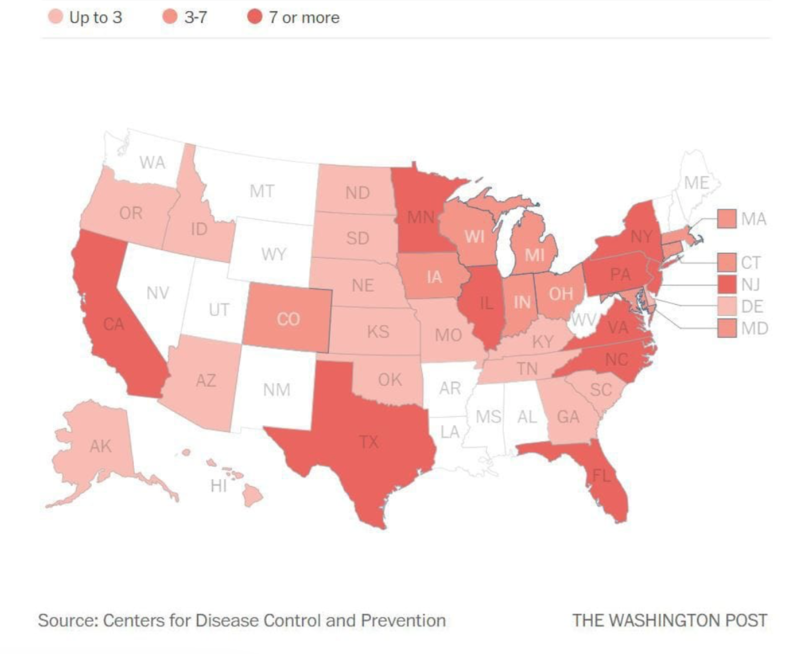 The very tension seems one that the WaPo graphic seems designed to trigger or provoke: the pinkish coloration that’s retained by turkey meat is usually caused by increased storage of oxygen in myoglobin in turkeys, and amplified by the presence of nitrates often included in turkey feed. But the pink tinge of some cooked turkey meat gives it a redder coloration recalling underdone meat, falling on the end of the “meat” color spectrum above, leaving many in the nation that cooking a bird to an internal 160 degrees is insufficient, and warned of the dangers of eating raw meat, which the rosacea ramp in WaPo asks us to re-imagine the national fabric–in an image that cannot but recall an electoral map–provokes. The breaking down of cases by states is derived from the CDC warning sites, but provides almost no epidemiological information, of course: the turkey appears contaminated in the farms where they were bred, and the presence of contaminated ground meat in more populated states offers little clue to the origin of the outbreak, but only the range of turkey products now consumed–and the danger signs of rosacea-colored meat lying beneath the carved breast. 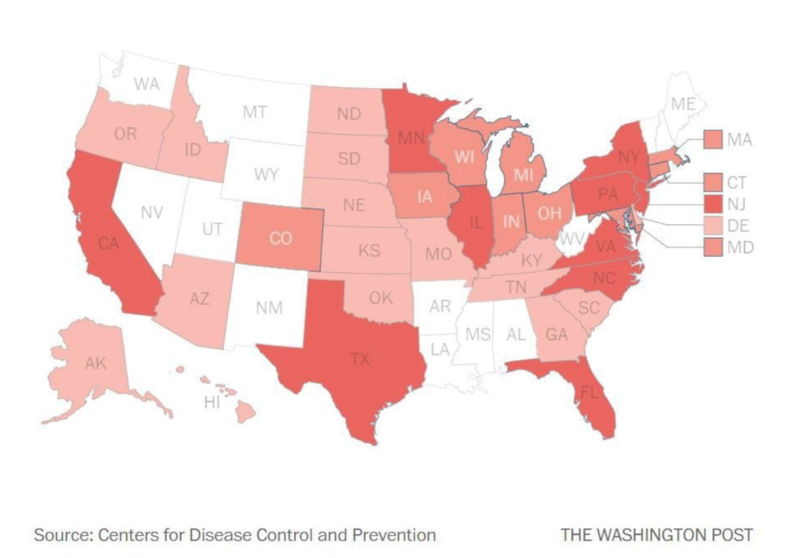 The map raises immediate questions: are folks in Alabama, Louisiana, Mississippi, and Arkansas actually afflicted by Salmonella infections, but just haven’t reported the illness to health authorities to be toted up in such a map? The absence of illnesses reported in some states–West Virginia, New Mexico, Louisiana and elsewhere–may be due to the fact that many chalk it up to distasteful upset stomach, rather than have their disturbances medically diagnosed–assuming that all doctors diagnose. Any data vis is only as good as its numbers, reliance on self-reported numbers are even weaker. The map of the outbreaks of diseases among humans are difficult to trace to large distribution networks of primarily ground turkey. But were the outbreaks evidence of antibiotic-resistant strains that incubated in a nationwide network of factory farms? The recent outbreaks of salmonella were so frightening because they were found in multiple states and in multiple brands, sickening sixty-three individuals, has both led to the recall of 91,388 pounds of raw turkey meat from Wisconsin’s Jennie-O brand raw turkey–a branch of the second largest turkey-producing company. Despite ethical questions of disposing of so much raw avian meat–what to do with it? cook it and send it to homeless shelters? cook it and kill the strains?--even if much of the raw turkey was ground, it raised the terrifying specter of little to be thankful for in a set of mass-hospitalizations on Black Friday–as was rendered in an apparent cartographical color-ramp of underdone meat, each associated with the impending deepening of the danger signs of consuming underdone bits of bird–as well as the potentially cascading nature of infections among birds in factory farms.